What if the royal families of every nation had super powers? Only Kings and Queens mind you, Presidents and Prime Ministers don’t count, only those with royal blood. The year is 1940 and Britain is being bombed by Germany every night. The sleeping giant of Japan is poised to attack Midway and Pearl Harbor, and Prince Henry can’t take it any more. He can’t adopt the attitude of “eat, drink and be merry for tomorrow we die” that is his brother Arthur’s mantra, but instead feels compelled to intervene and use his power. But Henry is not the only one with power, and his actions have awakened the royals of other nations, threatening to destroy all he holds dear. This is a war comic, not a super-hero comic, and it only bears a slight resemblance to the way history actually played out. We have the inclusion of figures like Roosevelt and Churchill, but a largely fabricated royal family. And it’s this lack of attention to history, particularly the attitudes of the royals that downgrades this book in my view. The family here throws giant banquets while the people in London starve. The real royal family underwent the same rationing as the people in London, and had to contend directly both with the bombing, and with the loss of a son in the air force. The royals in the real world are heroes. 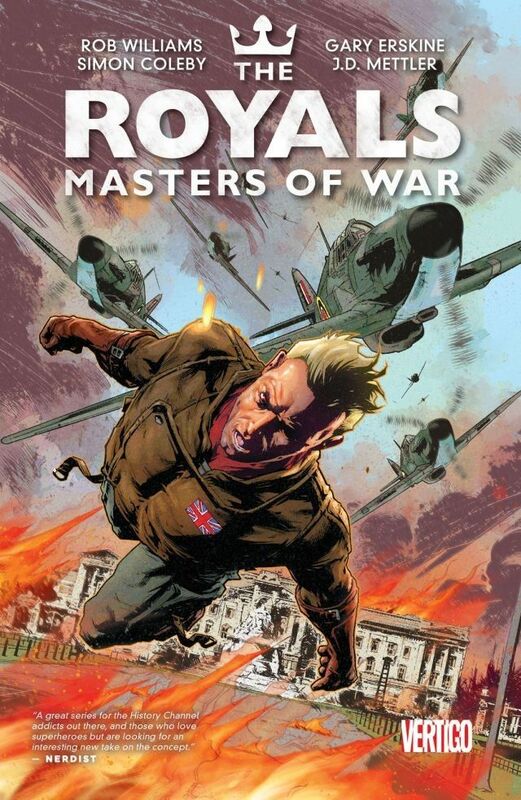 The royals in this comic are twisted, incestuous, power-mad and psychopathic. Henry, for all his noble ideals, is in love with his sister Rose. Arthur is a callous brute who thinks nothing of tearing a man apart (rather gorily I might add) just because that man wants a woman Arthur only wants because she’s the only port in a storm. This book actually had me rooting for the Japanese emperor, who acted with more honor than any of the royal family. The most interesting aspect was the way the powers took a toll on people over time, psychic powers driving the Queen mad, and causing Rose to be taken over by the personality of a spy they are sent to save. But otherwise the book is humorless, grim and the twists lack punch because you don’t care about any of these people. I would honestly read a book about the real royal family before I would read this one. One of the few NetGalley titles I didn’t care to finish. And this from the man who’s read several volumes of Angry Birds comics.